With Readly you can read Real Crime: 20 Most Shocking Murders and thousands of other magazines on your tablet and smartphone. Get access to all with just one subscription. New releases and back issues – all included. "The sickening decision making that leads to someone committing the most shocking of murders is as horrifying as it is fascinating. 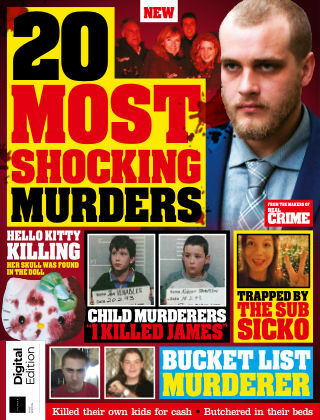 20 Most Shocking Murders will delve deep into the most senseless killings and premeditated attacks. Learn the uncomfortable details of how two young children savagely murdered a toddler in broad daylight, and discover the lies that were told to hide the truth about an axe killing. The depraved acts themselves are truly stomach churning – from the cruel and calculating to moments of sheer madness – and this brand new bookazine will uncover the gruesome facts and startling truths behind these atrocities. Inside you'll find: - It’s Murder, Isn’t it? The drunken killer that admitted to slaying his neighbour - Kids that kill The toddler abducted by two twisted school boys - Trapped By The Sub Sicko Journalist Kim Wall was lured to her death - Butchered In Their Beds He axed down his family then pleaded his innocence -The smug smile of the ‘Coffee Killer’ The seemingly unremorseful cyanide coffee shop killer - Wine and Die They dined together for Bernd Brandes’ last meal - Strangled by Her neighbour Joanna Yates disappeared after a weekend alone at her flat - The Cabin in the Woods murders The unsolved case that still provokes conspiracy - Shot Dead Live on Air The senseless killing of a reporter and cameraman - Hello Kitty killing Sadistic killing that Hong Kong will never forget - The Perfect Murder They thought they had a watertight alibi - Dragged from their tent Three girl scouts killed on their first night at camp - She watched as her Children Drowned The mother that sent her children to the bottom of the lake - Black Metal Murder Exciting music and three tragic deaths - Bucket List Killer Serial killer-obsessed Jemma Lilley had a goal in mind - Who Killed JonBenét Ramsey Was the ransom note real? - Pensioner’s Revenge The 71-year-old that went on a killing spree - 'Shameless’ Father Slays family A senseless plot to play the hero ended in murder - Left them on the fence Three innocent lives lost -Jekyll and Hyde He was given support and repaid with murder"